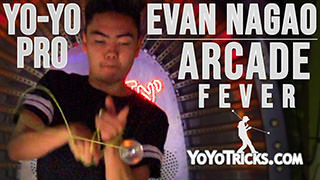 How to do the trick Level 100 Gyrados from Evan Nagao. To start off, you are going to want to make sure that your string tension is neutral, because this is a slack trick and you want to make sure that the slack will stay open when you do the slack. You are going to start off in a Trapeze. 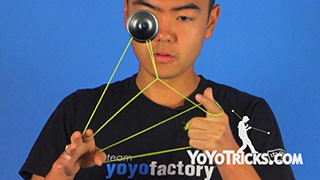 You are going to take your index finger on your throwhand and put it around the string connected to your yoyo finger. Then you are going to take your non throwhand thumb and stick it into the loop, to open up the loop. Then you are going to take your throwhand palm face up and stick it into the loop. 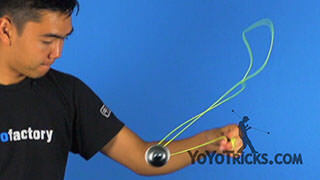 Then you are going to grab about two inches above the yoyo. 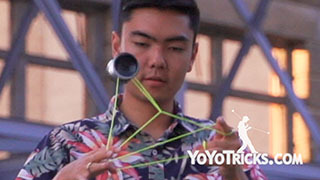 Then you are going to drop the string on your non throwhand. 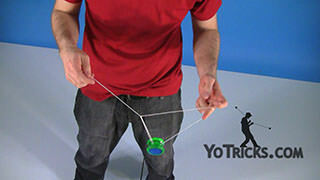 You are going to grab just about two or three inches below the yoyo. From here you are going to point your throw arm elbow pointed outwards. Then you are going to turn your throwhand palm face down. Then you are going to take the string segments you are holding with your throwhand. 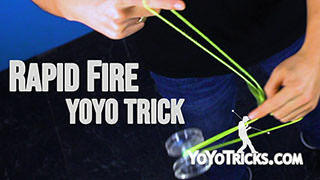 Wrap them one time over the front of the yoyo. You are going to drop the string you are holding with your throwhand. Pull tight. That will cause the yoyo to start to Gyro forward. 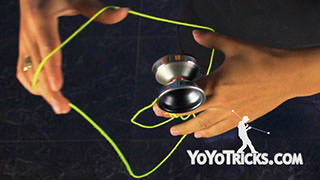 Then once the yoyo hits 90 degrees, you are going to swing the slack over one time. Continue swinging the slack as the yoyo turns to 180 degrees. 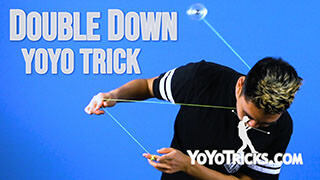 This time, you are going to swing the slack over to the side closest to your non throwhand. 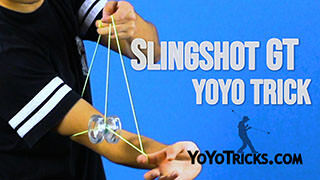 Notice how the slack string twisted around the gyro string transfers from one side of the yoyo to the other as you swing the slack around. So to prevent the yoyo from tilting off, you are going to want to make sure you swing your hands at the same time. 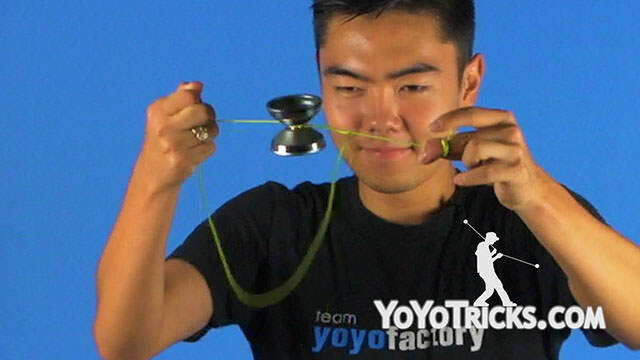 You keep them in line with the yoyo. Also, you want to make sure that even though we talked about this slack swinging around in steps, you want to make sure you are doing it all in one motion. That will prevent the string from tangling up in the yoyo. 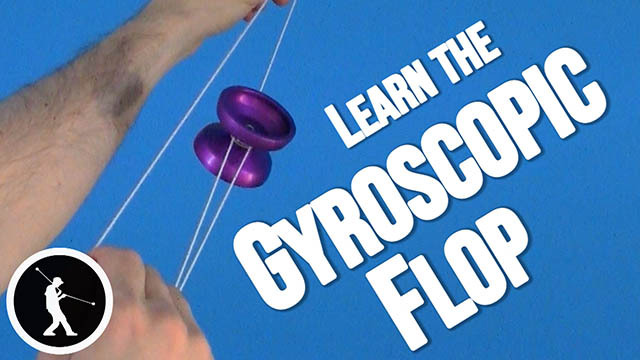 Once you have got the gyro down, the next step is to bring your throwhand on the inside and under the yoyo. 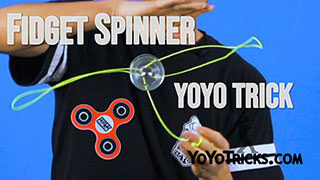 This will drop the yoyo into a backwards GT. All you have to do to reveal it is to bring your non throwhand over your throwhand. 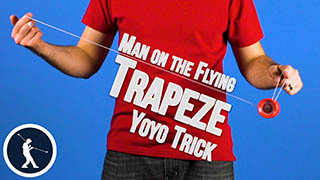 Then you are going to pop out the back of the triangle and uncross your arms into a trapeze. 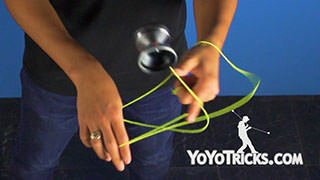 Since you did the gyro, the yoyo will be spinning the opposite direction and you can bind from this position. 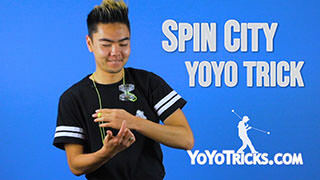 To do the version of the trick with the pivot in your body, you are going to do the same thing with your throwhand, bring it under and inside the yoyo, but this time you are going to bring it behind your throw arm. At the same time, you are going to pivot your whole body 180 degrees. 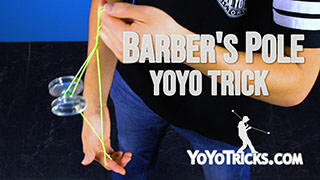 From here, you are going to pop the yoyo out the back of the triangle, and in front of your throw arm, and on to a Trapeze, while pivoting your entire body back to its initial starting position. It is important to check the foot positioning as you do any type of trick that involves a body pivot. 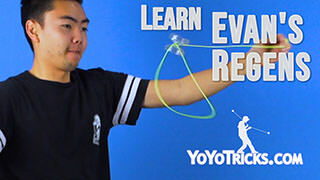 In this case, when you do the triangle, you are going to pivot around your throw foot. 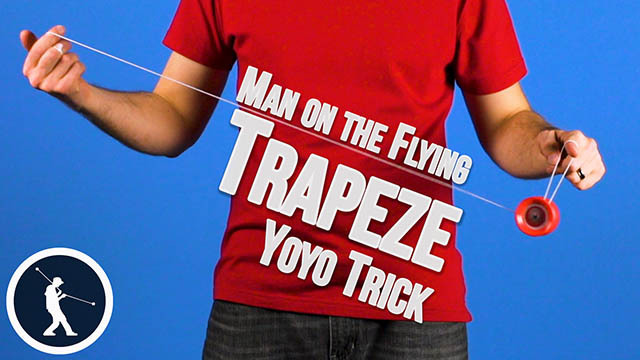 Then when you pop the triangle, you are going to pivot again, back into the trapeze, and land it to your hand. And that was Level 100 Gyrados. It is a widely accepted fact that all the best players can also do 2A.